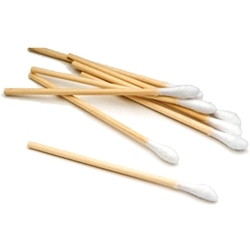 These handy 6 inch Cotton Swabs have endless uses and can be helpful for all procedures. Use them to apply anesthesia, wipe a procedure area or apply petrolatum to the procedure area post procedure. These tools serve as an excellent take-home for client. Each unit contains 10 pouches of 100 swabs for a total of 1,000. Medical stand measuring 13" x 19". Includes removable and height-adjustable stainless steel tray to hold all of your Permanent Cosmetics procedure supplies. Use this product to secure protective bibs around the neck of the client to prevent splattering pigment from staining clothing.